Dolcetto is what most people in Langhe and in the rest of Piedmont still drink every night for dinner,” says Barolo producer Franco Massolino. You don’t see many wines from Liguria (the gorgeous stretch of coastline that extends from Tuscany to the French border) in the U.S. This fresh white, made from the indigenous Pigato grape, offers clean aromas of wild sage and freshly cut grass and isn’t hard on the wallet. Governed by the culinary philosophy of using quality local ingredients, chef Mario Batali, of B&B Ristorante, created this decadent dish that’s easy to prepare at home. When you think of French rosé,the first thing that comes to mind is Provence. The classic pale pink wines of the region depend on a number of grapes, but Grenache is a major player. A 2014 Bandol rosé from Domaine de Terrebrune in the nearby town of Ollioules is alive and almost explosive in the glass, dry and savory. Inspired by Amy! Thank you! Expect an explosion of sweetish red fruits in the spectrum of candied cranberry, strawberry and raspberries. This is great, but this is just the start! Enter savory and floral notes reminiscent of lavender, smoke, leather, bacon fat, saltiness and freshly cut green grass. *This wine will treat you especially well during lunchtime drinking because it typically has light alcohol*. Frappato might just be the perfect bacon burger wine. Afterall, wine-and-burger pairings deserve to be taken to the next level. If Sicily has anything similar to the delicacy of Pinot Noir, NM is it. Most of the vines grow close to Mount Enta, so they give off a distinct smoky volcanic aroma along with a basket of fruity-flower flavors of cherry, raspberry, plum, rose and violet. It tends to sway on the sweeter, more plush, end of the ‘pinot noir-like’ spectrum but not without additional complexity of leather, pink peppercorn and cocoa. 19# Nero d’Avola Le Vigne di Eli Etna Rosso 2012. No. 4# Discover Artisan Wines – Venture Outside of Popularly Rated Wines. Love Sauvignon Blanc? Try a Pinot Bianco. USING Alto Adige’s famous Pinot Bianco TO SEGWAY to Robert Sinskey’s Pinot Blanc (375ML half-bottle) 2013 Fulfilling aromas and flavors of fresh pears, apricots, casaba melon and a hint of mineral-like complexity complimented by tart notes of kaffir lime.Though this wine sees no oak, it has a slight essence of yeasty toast. SEGWAY: Here is what Jefferson had to say on Nebbiolo: As sweet and silky as Madera; as astringent on the palate as a Bordeaux, and as brisk as a Champagne. Nebbiolo was sweet before the Marchesa Falletti got involved in the fermentation process. Madera–essentially shaken wine–was discovered as a consequence of using barrels of wine as ballast on trans-Atlantic sailing ships. Clearly lots has happened since…including a cloned Puilliac Lafite-Rothschild that was planted in Italy, which won the Paris 1968 show and perhaps inspired Italians to today’s heights…See Angelo Gaja, and Antonio Galloni in My Wine Picks section regarding Chris’s Wine List. If info on No. 25# (a Nebbiolo) is requested, I can immediately do a find here on 25# to get an excerpted review below (which I can progress via incremental improvement and testing) with notes…Just like the Summer-Fall-Esoteric theme I led with! Here is A Wine Technique that can be built on easily. Jotting Three Notes which could be: First the Fruit Aroma (found on lower rim of wine glass); Second the Floral/Spice (aroma at top of rim) and Third the Earth qualities (in the middle) of a glass of wine. Perhaps the aroma is mirrored on the palate. I have found this aroma technique keeps it simple and cuts thru incredible complexity as does having a searchable list of wines. ~ Thank you, Jane Nickles, The Bubbly Wine Professor. An Overview Comparison of Wines of Tuscany. I would pick No. 25# Barolo Gaja. He is an Italian wine producer from the Piemonte region in the district of Langhe, chiefly producing a number of Barbaresco and Barolo wines, and later diversified intoBrunello and “Super-Tuscan” production. Its current owner and president Angelo Gaja is credited with developing techniques that have revolutionised winemaking in Italy, and terms such as “the undisputed king of Barbaresco”, and “the man who dragged Piedmont into the modern world” have been applied to him, and whose Barbaresco wine is considered a status symbol on a par with Château Lafite-Rothschild or Krug. Gajas 2004 Barolo is being Celebrated by Vinous / Antonio Galloni (Robert Parkers ex partner) in October 2016 for a reprise rendezvous. INTRO: In Italy Red wines (are Rosso) and Whites (are Bianco). Note that New World i.e. USA is usually more Fruit Forward, longer growing season, hotter climate, riper grape, more alcohol (more body). Old World i.e. Italy more Earthy, less fruit forward, more acidic, less ripe due to less growing season, less hot, less alcohol. Sommeliers, even with new world signature dishes, pair with old world wines because they do not overpower the food but blend with it. It’s designed to clean palate, invite next bite. International style is trending where old world wines are milked for as much fruit forward as possible to reach American audience where fruit forward is more palatable. I am also reviewing a flow chart of light medium bold and fruit forward Vs earthy within old world i.e. Italy. Not rated yet. I am going to start in NW Italy in Piedmont or Piemonte or foot of the mountain (Alps). It includes Langhe valley and Asti. Climate is not condusive to growing Bordeaux as in France and Napa Valley. Instead maybe because of proximity to France, they tend to focus on more elegant, prettier yet earthy stoic grape varieties. The main grape in Piedmont is Nebbiolo, and refers to fog rolls in and covers the hills of Langhe valley which is what Piedmont is known for. This grape produces several different wines of similar style but because of location w/i Piedmont have different variations. First of all, Nebbiolo produces Barolo. Tend to mirror full bodied earthier Pinot Noir style or wine from Burgundy France. They age remarkably well 10 to 15 years. Beautiful, elegant refined with Roses, tar and leather notes and sweet cherry fruit. It’s kissing cousin, is a commune of Barbaresco right next to Barolo. Now Barberesco is hilly, same grape variety however soil is slightly different and elevation a little quirky, so what you get is MORE ELEGANT version of Nebbiolo. Still able to age to the Dickens. A full bodied Barberesco will compare favorably to a lighter style Barolo. These wines are what are called Burgundian in style. Fragrant. Effusive. Little chewy when young. Not deeply colored. It’s lighter colored. It’s about aromas and perfumes. Wonderful balsamic and cherry aromas and flavors. Then we have Barbera from sub zones of Asti and Alba in Piedmont. Barbera is an at home because it’s so versatile, insanely fruity, wonderful dark black cherry type fruit component in the wine. Acidity is racy. Beautiful acidity. Develop sense of complexity. Richness without heaviness. If want color punch and fruit but without too serious then Barbera is route to go. No body does it better than Piedmont. Other major grape variety in Piedmont is known as Dolcetto. These days not so sweet nor little. It’s about romance. Piedmont is about eating and drinking and some partying. Tuscany I think of bringing my wife, cypress trees, rolling hills, sunshine and the wines convey that vibe. Not so warm as beach. Not beach wines. But not so cold winter wines either. They strike wonderful balance. That’s why you need them in your life. Great thing in Tuscany you basically really need one wine grape to get a grip on. The grape is Sangiovese. Produces most of go to Tuscan wines. You have Chianti Classico. 80% Sangiovese. Brunello Di Montalcino. Montalcino is a region just south of chianti region. Made from grape called Brunello. It is Sangiovese (Grosso little browner skin, little larger grape providing richness structure intensity, aristocracy to the wine. So fetch a bit more money than Classico. Beyond that along Tuscan coast south of pisa there is whole new genre based on Bordeau varieties of France. Soil and climate mimics Bordeau France. Bolgheri is a little of the bling area. In sum these wines have bright acidity, red black berry fruit, balsamic notes. See 1# thru 39# wine links below. Work-It-Out list I am Progressing Via Incremental Improvement and Testing. Starting with Bubbly / Chardonnay. Balance is as a major THEME thru out this Wine List, I am reviewing. E.G. The writeup certainly presents that. Medium lemon in color Aromas of intense notes of brioche (enriched bread), followed by Green Apples, Lemon zest, Honeysuckle, and Tropical fruit. Soft on the Front of the palate with nice Lingering acidity on the finish. Flavors of fresh green apple and pineapple with great structure from top to bottom. In sum: 100% Chardonnay. French “Champagne Roots, Method and American Dream, Terroir. NB The family of Laurent Gruet still owns Gruet et Fils, in Champagne, France whilst running the Gruet NM USA. Perhaps more famous than the variety name of Cortese is the wine called ‘Gavi’ which is the name of the town in the southeast part of Piedmont. Gavi wines are made in a dry style and are known for their lemon-like citrus flavors and tingly acidity. Cortese has the same mouth-zapping refreshing quality as some Pinot Grigio and Chablis wines. Fini this section with one more BUBBLY: PINOT NOIR with touch of Chardonnay. 2# Vesselle Blanc de Noir [Pinot Noir 90% with Chardonnay 10%]. Domaine Jean Vesselle crafts “grower” Champagne, a récoltant-manipulant house that grows its own grapes and makes its own wine all on site. The point: More natural nuances not present with conventional farming show themselves as are more balanced fruit with more present acidity. Of a straw-yellow colour, the aroma has intense and clearly deﬁnable ﬂavours of Pear and Golden Delicious Apple, Jasmine and Lily of the Valley. On the palate, it is soft and markedly sapid. Love Sauvignon Blanc? Try a Pinot Bianco. 3# Step outside the box — the box of ordinary white wines: Chardonnay, Pinot Grigio, and Sauvignon Blanc. Good on its own. The wine is bone-dry and crisp, with citrus and mineral notes. The area’s proximity to the Ligurian coast, the Italian Riviera, has made Gavi a natural partner for seafood. Grown in the Piemonte region of northwest Italy with the Cortese grape, Gavi is acidic yet fruity, dry and balanced, with a steeliness **NOT OFTEN FOUND in Italian whites**. Fantastic with seafood, it also partners well with pasta with cream- or lemon-based sauces, grilled vegetables or chicken Caesar salad. Much richer than the pigato I drank in Liguria. White melon, white grape and pear. Beautifully balanced with medium acidity and mild sweetness. 7# Failla The 2013 Chardonnay (Sonoma Coast) is a terrific appellation-level bottling. Lemon oil, apricot pit, white pepper and chamomile are all very much alive in this beautifully expressive, pliant Chardonnay. The finish bristles with a real sense of energy. This is pure class ALL the way. 8# Lieu Dit Pinot Noir 2013 s/b 2014 From a very sandy vineyard site just to the west of the Sta. Rita Hills and farmed biodynamically, this pinot noir was fermented whole cluster for about two weeks before being pressed. It was then taken down to neutral barrel and rested on it’s lees for almost a year before being racked to tank, filtered, and bottled. With such a large influence of whole cluster in the wine, the aromatics show lots of wild cherry, rose petals and clove. Similar notes show on the palate with vibrant red fruit flavors, great acidity and balance. Aromas of orange blossom and ripening strawberries. 66% old vine pinot noir, 34% pinot meunier. Easy warm weather drinking, light bodied, crisp with a persistent citric finish. POE was founded in 2009 by Samantha Sheehan, an advocate of the vineyards and wines of Burgundy and Champagne. The brand; Poe, was created to show that California too has incredible and distinctive terroir, varying dramatically from one microclimate to the next. 9# Domaine de Terrebrune Bandol Rose 2014 Rosé from Provence, France RP91 V91 Light pink/salmon in color, with classic orange blossom, melon and tangerine aromas and flavors, as well as that salty minerality that’s common from rosé from the region, Domaine Terrebrune’s 2014 Bandol Rose is medium-bodied, juicy, rounded and nicely textured, with bright acidity coming through on the finish. It’s a beautiful rosé to drink over the coming year or so. PART IV THE REDS with Burgundian (Pinot Noir) and Bordeauian and Sangiovese thread. To START its back to Alto Adige not quite as famous as Burgundy but still FAMOUS for Red Pinot Noire. 13# Banshee Sonoma County Pinot Noir 2014 The 2014 is strikes a beautiful balance between both RED and BLUE fruits, notably Bing cherry and Asian plums. Interwoven with the fruit characteristics is coastal MOSS, fresh wild Mushrooms and Spice. The wine has good carry-through from front to finish, with lively acidity to keep it light on its feet. Antidote to heavy tannic heavy alcohol wines. Carbonic maceration = low tannin. The full name of this French red wine grape is Gamay Noir a’Jus Blanc. Gamay wines have gained prominence in France’s BEAUJOLAIS region where this grape, which represents 98 percent of all vines planted, reigns supreme. They’re so associated with Beaujolais that winemakers outside of the region often try to imitate the style of immediately drinkable, light- to medium-weight wines with high ACID and low TANNINS. These light purple, fruity wines suggest flavors of bananas, berries, and peaches. Ideal US hipster wine! Unloved grape: 60-70yr-old Valdiguié aka Napa Gamay, anti-Parker, New California, hip label, terroir-lovin’ wine maker in Berkeley. Restored my faith in CA wine. Nose: fruity BEAUJOLAIS style, but with more green peppers. Tart cherries, pickled Japanese plum, some animal funk and vanilla. Palate: the closest I’ve been to umeshu plum wine. Lean+light! Sour apricot, plums and cranberries burst with low tannins. Nice acidity contrast. Floral greenness+warm vanilla aftertaste. 16# Centonze Frappato 2013, a beautifully floral Sicilian red JG91 13% alcohol. Sweet, supple, floral nose of red cherries and rose petals. On the palate this shows supple, sweet fruit with red cherries and plums. It’s quite light-bodied, but generously flavoured, with a slightly grainy structure. Fresh, supple, pretty and delicious. Grown at 800 m altitude at a northern face slope of Etna mountain with mostly stony light sandy loam soil. Macerate for 18 days with good tannin extraction and used French oak for 3 months. Beautiful pinot noir color. But 100% nerello mascalese. High intensity nose of smokey perfumy quality and good mineral with light sour cherry and raspberry. High acidity with medium minus firm gritty grind tannin and a medium plus finish of smoked cherry juice. It’s wonderful snappy black berry character. Crisp fruit component. In sub zone of Dogliani in Piedmont. Takes on dark inky appearance. Almost looks like Petite Syrah but much racier and have almondy almost nutty backbone to them. Lightly tannic and tend to be bit grippier than Barbera. Dolcetto is less tannic but sometimes APPEAR more full bodied. CF with Gamay. Antidote to heavy tannic heavy alcohol wines. Carbonic maceration = low tannin. Barbera resides just above Dolcetto in the Piedmontese pecking order of grapes. It matures later and is bigger in flavor than Dolcetto. As with Dolcetto, the flavors are decidedly cherry, ranging from sweet-tart to black. Cocoa and chocolate notes appear again, too, making one wonder if perhaps some of the similarities between Barbera and Dolcetto are due to the terroir of Piedmont. In general, Barberas have a chewy, leathery, earthy element that can add complexity, but also some toughness. Without doubt, the grape is decidedly higher in acidity than the friendlier Dolcetto. If Barbera has one particular problem, it would be its natural high acidity. To address this, producers are taking action in a few ways. Many are harvesting the grape later than ever before, seeking greater ripeness and a reduction of acidity. Traditionally, Barbera was brought in between the early-maturing Dolcetto and the late-ripening Nebbiolo (from which the esteemed Barolo and Barbaresco are made). However, as a rule these days, producers are seeking longer hang times, and when the vintage permits, they may even allow their Barbera to remain on the vine longer than the Nebbiolo. “Dolcetto goes with everything,” says Garola. “I really love it with pasta e fagioli, but it’s a wine you can enjoy right through the meal, from the first course to the meat dishes. From northern Italy, barbera has a much more pale color and notes of cherry and unripe raspberry…. Nice depth for a Barbaresco. 25# Gaja DaGromis Barolo 2010 Intense red in color with full aromas, rich with berries and floral notes as well as aromas of licorice, dried herbs and spices. This wine has a solid structure on the palate and a rich softness as well as a lingering finish. VIP Although Barbera is rapidly gaining ground, Barolo and Barbaresco are still the defining wines of Piedmont. With a string of good vintages still in the pipeline, now is the time to be buying. As springtime approaches, wine lovers’ thoughts begin to turn away from the sturdy wines of winter and toward light, refreshing wines to be sipped outdoors on a balmy day. On the other hand, when the frigid grip of New York’s winter descends, you try convincing wine critics to taste cool, crisp Pinot Grigios. Thankfully, there are some wines that can bridge the seasons easily. “Barolo is unique,” asserts Paolo Abbona, owner of the Marchesi di Barolo winery. “It can go with multiple courses because it ‘washes the mouth,’ allowing you to taste the food.” In parallel fashion, despite its reputation as a heavyweight, winter wine, its acidity allows it to transition into lighter seasonal fare, such as roast chicken. Barbaresco, its more elegant sibling, does so even more easily. The eastern part of the zone, around the communes of Castiglione Falletto and Monforte d’Alba, have more sandstone; the soils around Barolo and La Morra have more clay and limestone. Cannubi, Barolo’s most famous cru, is the only site to combine both soil types, according to Abbona, one of that vineyard’s largest land holders. 28# Vietti Perbacco Nebbiolo delle Langhe 2013 This wine offers up generous fruit along with menthol, spices and hard candy, showing notable intensity while retaining an essentially mid-weight style. Strong, intense and powerful when young, complex and elegant with proper aging. Absolutely magnificent wine. Deep berry flavors and dark red cherries. Almost dark chocolate like at the finish. High alcohol content but still delightfully smooth and flavorful. 32# Caparzo Brunello di Montalcino 2011 Sangiovese from Tuscany, Italy V94 The 2011 Brunello di Montalcino is a terrific wine for the year. Sweet red cherry, plum, tobacco, mint, sweet spices and orange peel are all front and center. This is a gorgeous 2011 Brunello that represents everything the vintage can be; open-knit, accessible and polished. I don’t expect the 2011 will be a long-term ager, but it is exceptionally beautiful and delicious today. 34# Cataldi Madonna Malandrino Montepulciano d’Abruzzo 2013 sb 2012 V92 Deep ruby. Enticing aromas and flavors of mineral-driven red cherry, dark berries and herbs. Very fine-grained, precise wine with a clean finish featuring noteworthy freshness and noble tannins. Malandrino is Cataldi Madonna’s most improved wine and one of the flag bearers of the new wave of very successful unoaked Montepulciano wines now increasingly in fashion. 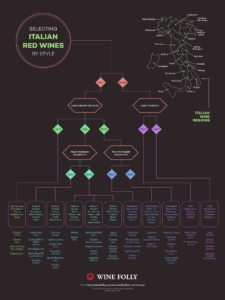 Why Bordeaux and why terroir from California, Italy and Slovenia? One reason is to provide value of CONSISTENCY of VINTAGES to hedge Bordeaux climate off and on higher HIGHS, lower LOWS. But ALSO to progress variety, novelty and EXCITEMENT between say Bordeaux’s Puilliac, St Emilion and Steph. Chris of Biancos has multiple Bordeauxs that showcase markedly at least 3 different terroirs. AND at the same time Tuscany is a close emulation, double, doppelganger to LEFT BANK of Bordeaux. Wine news. Note 2013 was worst Red vintage of quarter century in Bordeaux France. But dry Bordeaux whites were Top of Mark. Ying and yang. The restaurant is covered on many levels with its 2013 Bordeaux Blends from Santa Ynez, and Tuscany, Slovenia 2007, and 2009 Santa Cruz. Here are WINE NOTES of 3 Bordeaux Blends; a Montefalco Sagrantino and Mt Eden Calif Cabernet Sauvignon. My third wine from this great Slovenian wine maker from the border with Friuli, Italy. This ‘Bordeaux’ blend with 60% Merlot, Cabernet Sauvignon/blanc, is quite standard, but with a little rebellious side. Nose: heady, unique, slightly herbal, candied sour cherry that turns jnto licorice, before showing tertiary notes of time: tar and dried figs. *What does Kirsch taste like? The cherries are fermented complete (that is, including their stones). Unlike cherry liqueurs and so-called “cherry brandies”, kirschwasser is not sweet. The best kirschwassers have a refined taste with subtle flavors of cherry and a slight bitter-almond taste that derives from the stones. 36# Habit Red Blend 2012 sb 2013 V94 The 2012 Red Wine Santa Ynez Valley, a blend of Cabernet Franc, Merlot, Cabernet Sauvignon and Petit Verdot, is superb. Layers of rich plummy fruit, savory aromatics and pulsating minerality open up in this effortless, radiant red. A rush of Cabernet Franc notes round out the finish. The 2012 isn’t a huge wine, but it delivers extreme pleasure. Don’t miss it. 37# Bordeaux Blend Angelo Gaja Ca’Marcanda Magari 2013 JS93 A solid red with silky and polished tannins, pretty blackberry fruit and hints of wood. Full body, fine tannins and a savory finish. Racy and transparent in style. Bordeaux blend. CHARACTERISTICSRuby red, intense colour, rich and persistent to the nose, a play of small wild berries and lightly spiced. Full and robust, also to the palate, and deep and velvety in the mouth. The best grape you may have never heard of. Much bigger and impressionable than any chianti or barolo. Unreal value, memorable finish. Good nose, nice varietal character. Not as full-bodied as most Sagrantinos, ah that balancing theme.